In 2018, Collective will open its new home—the restored City Observatory on Calton Hill, Edinburgh. Reflecting on the long journey undertaken to reach this point, Towards a City Observatory: Constellations of art, collaboration and locality, invites artists, writers and thinkers to imagine a new kind of observatory, which brings people together through contemporary art. The publication represents a moment of pause for Collective on the threshold of change and considers some of its pivotal projects from the past five years to inform the future. 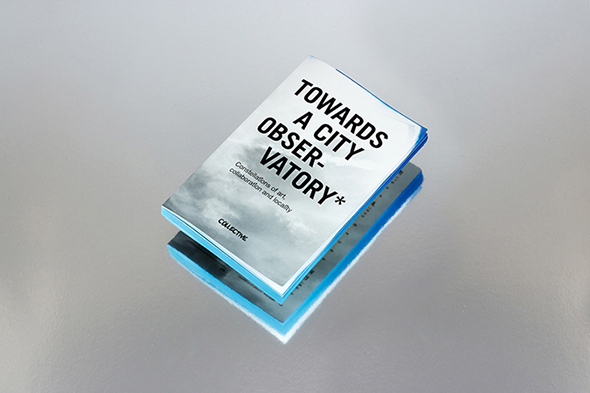 Towards a City Observatory features contributions from Charles Esche, Lesley Young, Simon Sheikh, Emma Hedditch, Wendelen van Oldenborough, Sharam Khosravi and many more of the peers who have helped to make Collective a plural entity since it was formed in 1984. The book is designed by Abake with a limited edition of 200 include a unique bi-colour edge. Chapter Editors: Julie Crawshaw, Fiona Jardine, Angela McClanahan, Jenny Richards and Frances Stacey.